Florida – where snowbirds winter and tropical trees thrive. When my friend Elaine Graczyk lived there, she had a beautiful Ficus salicifolia which was particularly well suited to warm winters. But her favorite tree was the Japanese black pine, so she tried to train her ficus as a formal upright. Branches were wired and pulled down. Tree in training, dressed in wire. But when the wire was removed, the tree rebelled at the idea of being shaped like a pine – and retaliated by sending its horizontal branches upward. 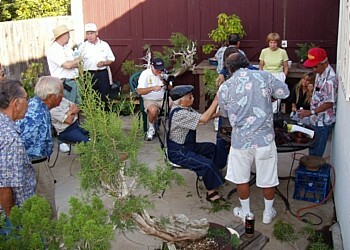 Later, Elaine and her bonsai moved to southern California. Every year, she struggled to reposition the ficus's branches. Then, one night, the climate gods brought an uncommon freeze. In just a few hours, every branch was dead. The aluminum harness strapped onto the tree was no longer necessary. 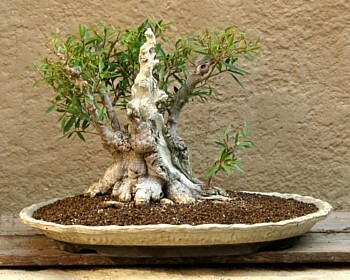 Only the base of the ficus had life when the temperature warmed up. In a few months, numerous sprouts had emerged from the base. Elaine wrote the tree off as trash and was eager to give it to anyone who might make something of it. 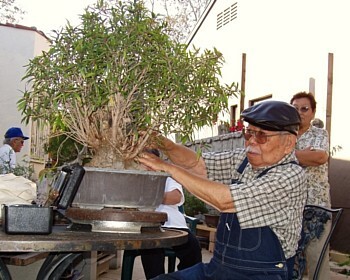 In September 2003, Elaine volunteered her feisty ficus for a design session with Nanpukai, John Naka's study group of select students. During each meeting, John and several members would hack away at a “sacrifice tree”. Sometimes a beautiful tree would emerge; other times, the demo tree died. Elaine, having almost lost her ficus once, wasn't too concerned if what remained ended up as firewood. John Naka studying the dead trunk ringed by new branches. Few people could transform a tree like John Naka. With his artistic eye and knowledge of trees, John was the master at finding not only the most aesthetically pleasing design but also the most appropriate style for a given tree. 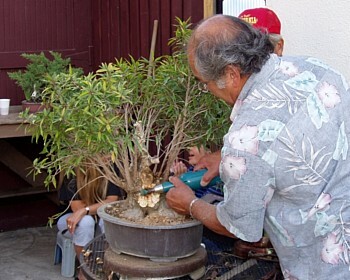 John was thrilled with the challenge of Elaine's ficus. He loved the base, the surface roots, and the new upright branches that circled the dead tree like a crown on a fat head. John had a vision to add balance and interest. He also had able-bodied student Mel Ikeda to cut, carve, and wire. The rest of us just stood around and enjoyed the process. John Naka and Mel Ikeda working while we watched. 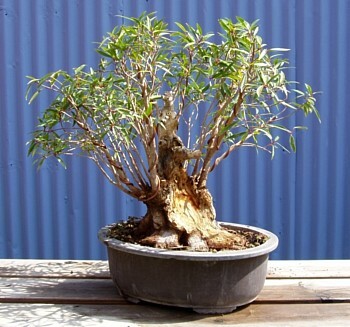 The first job was to reduce the number of branches so that the bush would look like a bonsai. John was troubled by the dead original trunk; it didn't relate to the rest of the tree, but removing it would leave a huge hole in the middle. His brilliant solution: create a large shari (dead trunk) line through the ring of branches and down to the roots like a glacier descending a mountainside. 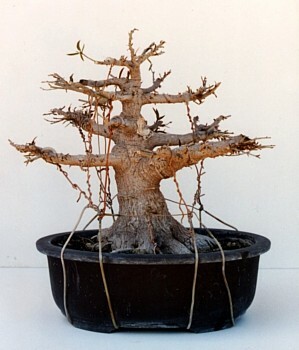 This shari line would connect the dead trunk to the rest of the tree and open up the branching to make the dead wood into a feature. Mel Ikeda creating shari from the dead trunk to the rootage. There were so many primary branches ringing the trunk that there was no room for secondary branching. Over the next several years, more branches were removed; those that remained were trimmed to encourage secondary and tertiary branching. A little wire, a new front, and a new lease on life. Last year, a very nice surprise emerged from the base of the shari line – a new trunk. 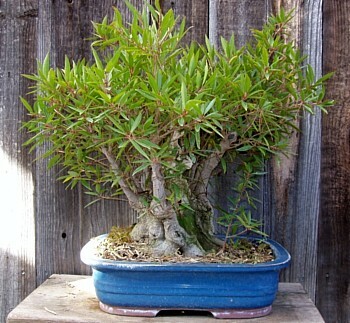 After thinning the number of branches, secondary branching and a sprout at the base of the shari emerged. Whenever I examined the tree, I kept turning it counterclockwise. As the shari line descended to the right, the rest of the rootage was most appealing. Unfortunately, there was one large branch blocking the view of the dead trunk. Behind this large branch was some interesting live wood. So this year, the final large cut has been made. The tree has been repotted into a more appropriate shallow tray. The new tray harmonizes with the old trunk. One day, the canopy will catch up. John talked about listening to a tree. In nature, this tropical ficus sports an umbrella-like canopy. This broom-style design and the upright nature of the branches lend themselves well to John's vision. It's just a matter of time and trimming to develop the canopy and ramification to take Elaine's trash to one of John's last treasure transformations. A sketch for the future.